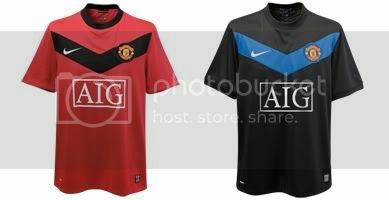 (07-17-2009, 05:16 PM)Ryanz Wrote: Any news on the launching of the new away kit? But is the away kit going to be changed this season too or maybe 2nd-half of the season then change???? United's new away kit for the 2009/10 campaign will be officially unveiled on ManUtd.com at 08:00 BST on Wednesday morning. The Reds will don the strip for the first time during Thursday's Audi Cup match in Germany against either AC Milan or Bayern Munich. It will be on sale at outlets including Old Trafford's Megastore, and online at store.manutd.com, from Thursday 13 August, but fans will be able to pre-order it online from 08:00 BST on Wednesday. 4pm Local time is the time we look forward to. very very very nice.. haha the rooney one does look a lil fake..